Introduction: Although NOTES research has shown substantial progress in recent years, some technical challenges remain. Among them is the suboptimal spatial orientation of the flexible endoscope within the peritoneal cavity. Due to the endoscope’s lack of rigidity, the ability to retroflex, and, more importantly, the coupling of the image source to the end effector instruments, spatial disorientation is frequently encountered during NOTES tasks. 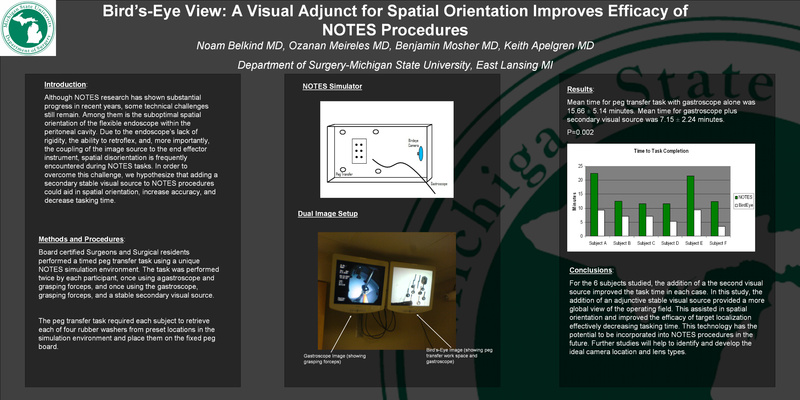 We hypothesize that adding a secondary stable visual source to NOTES procedures will help overcome these challenges by improving spatial orientation, increasing accuracy, and therefore decreasing tasking time. Results: Mean time for peg transfer task with gastroscope alone was 15.66 ± 5.14 minutes. Mean time for gastroscope plus secondary visual source was 7.15 ± 2.24 minutes. Two tailed paired T test P=0.002 between the two groups. Conclusions: An adjunctive stable visual source delivers a more global view of the operating field. This assists in spatial orientation, improves the efficacy of target localization and decreases tasking time. This technology has the potential to become an important adjunct in NOTES procedures. Further studies are needed to identify and develop the ideal camera location and lens types.